What do you do with meaty leftovers? If there is one thing I really hate to waste its meat. Not only does it have an effect on our shopping budget and although I am a fully fledged member of the meat eating club I do fully appreciate that there is a cost to what we eat and not just a financial one. Every week I cook a large chicken and we get a minimum of three meals from it. I start with a roast dinner for the family – two adults and two small children. At the same time I make up two small dinners for my little ones to have the following day – its really handy for when I’m working late and want my children to have a filling and healthy meal. It helps that roast dinners are the girls favourite meals. Then I will make a curry, pasta with chicken and sauce or similar. Finally myself and Andrew use the leftover cold chicken to make up sandwiches or salads for work. When the chicken is cooked I leave it to rest, the longer the meat stays on the bone the more moist it remains. I remove enough for our roast dinners and leave the rest of the chicken to cool fully. After our meal I get to work removing every piece of meat, nothing goes to waste and we love the thigh and leg meat too. Always remember to turn the chicken upside down after removing the breast, thigh and leg meat – there is a massive amount of moist meat underneath which I didn’t realise for quite a long time! The carcass doesn’t get left either – I use this to make up stock for soups and gravies. This week I was asked by Love Food Hate Waste to create a recipe using leftover meat and I got to work at trying something new. I came up with THE most delicious chicken lasagne recipe. I am a lasagne lover anyway, in fact a little too much and so I don’t make it that often but when I do I love it. I make a big one so that we have leftovers as everyone knows its even better the next day when the flavours have begun to mingle. This is a very indulgent dish and you would never guess it was made with with leftovers. It’s also perfect for using up the last bits of veggies you have lurking in your fridge or the random lumps of cheese you never seem to finish. Preheat your oven to 180c. Sauté your onions, garlic, carrots, and peppers until softened, add your chopped tomatoes, tomato puree, herbs and seasoning and cook for a simmer for 5 minutes. Add your chicken and warm though. While this is simmering start to make your white sauce. Melt your butter in a saucepan then add your flour and mix to form a paste (roux), add your warmed milk and whisk until smooth. Now add your mustard, seasoning and cheese. Mix until the cheese has melted and the sauce is smooth. Start to layer your lasagne with a layer of the chicken mixture followed by a layer of courgette, then add half of your pasta sheets and top with half of your white sauce and sprinkle with black pepper. Repeat and then top with your mozzarella, cheddar, tomatoes, basil leaves and black pepper. Drizzle with a little olive oil and bake for 30 minutes until bubbling and golden. It’s no secret that Britain loves beef – whether we’re grabbing a sandwich on the go, treating ourselves to a steak or tucking into a traditional roast dinner with the family. But we don’t always make the most of the meat we buy. In fact, around £260 million of beef products alone goes to waste each year in UK households. 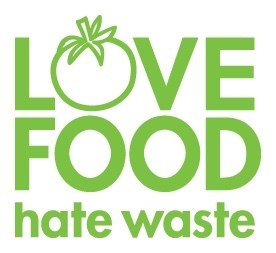 That’s why Love Food Hate Waste is launching the Meaty Issues campaign, sharing our favourite tips, tricks and leftover recipes to help us all to reduce the amount of beef we throw away at home saving us money and helping the environment along the way. To help spread the word, we’ve teamed up with farmer and television presenter, Adam Henson, to talk about how we can do our bit and to help you get the best from your beef. To celebrate the launch of our Meaty Issues campaign, we’re on the hunt for your best meat recipes and tips. Simply tell us your top trick for making meat go further or your favourite leftover meat recipe, and you could win one of three slow cookers from – perfect for cooking up a tasty stew or chilli! * This post is in collaboration with Love Food Hate Waste, I was compensated for my time in making this recipe and for the ingredients. Mmm, I love lasagne too but haven’t had a chicken one for ages. Must try this out! Impressed that you make a chicken last so long, my lot finish it off almost in one meal so there is usually only 1 leg (used for sarnies) left! I am always looking for ways to use roast chicken eat! I buy lots of rotisserie chickens plus roast my own. Lasagna is one of my favorite comfort foods! This is a wonderful twist as I roast a chicken at least once per week and always have leftovers. What a tasty way to avoid wasting food! I’m sharing this with my meat-eating friends so they can be as smart as you! Mmmm. comfort in a casserole. 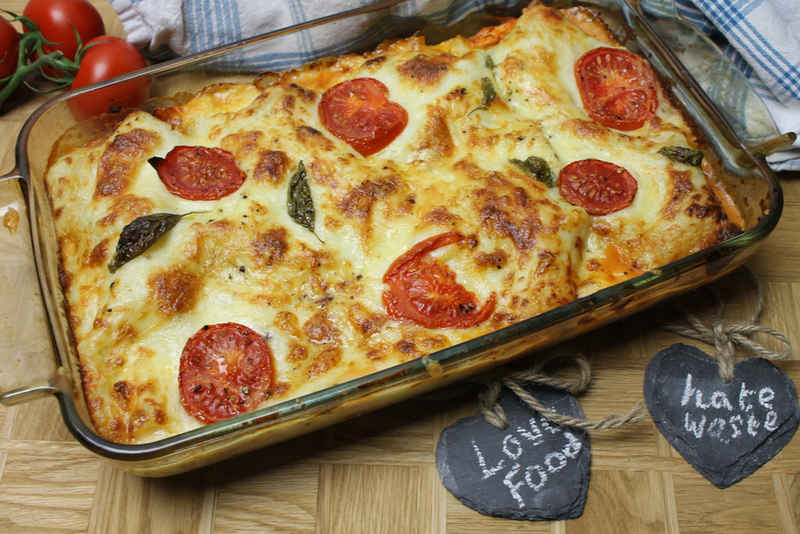 Lasagne is a perfect vehicle to use up leftover meat and veg! I hate food waste and always try and make the most of leftover by trying to reinvent them. This looks so comforting and yummy! Sadly lasagne, and especially all that gooey drippy cheese aren’t for me, however I reckon I would have loved one made with chicken. It never ever occured to me to make with with anything other than beef or quorn! ah poor you – my youngest can’t have dairy either so we ate this when she was in bed!